I visited the Waterford. The room was a little small, but the dining area was very nice. They had bingo, a TV room, and a pool table. It was very nice. My parents will be moving into The Waterford at Fairfield. It's very nice and upscale, but it's extremely expensive. They will be given two meals a day and a two-bedroom apartment. The place is newer, and the amenities are very nice. They have a very nice menu with specials every day. It's more of a restaurant-type rather than a buffet. They have a little kitchenette in the apartment because they don't supply breakfast, only lunch and dinner. They have great amenities. The apartments at The Waterford at Fairfield were very nice and clean but a little bit small. I live in my home right now and have more furniture than what I could probably fit in there, but it's a very nice place and the people were very cordial. They had activities and go to different places, like baseball games, with a bus service that would take you around if you have to go to the doctor. It's a retirement place, and I'm not really quite retired yet. The staff was very professional, polite, and accommodating. It was very clean and inviting. We chose the Waterford at Fairfield for my mother mostly because of location and the price. They have Wii games and crafts, and she has done all that. They serve 2 meals a day -- lunch and dinner. The staff is very helpful and very nice. We visit her a lot, so we have taken her to different places, but they do have a shuttle. They have laundry services, housekeeping, and everything else that she needs. The Waterford, has recently gone through some changes, and not for the better. The activity director has recently left, the facility, all the residents dearly love this lady. A nineteen year old girl was put in her place, whom has little to no experience, she treats the residents like she is the teacher and they are little children. The bus for outside activities has no lift so very few of the residents can go on outings. This is a unlicensed facilty, independent living, with many residents having dementia and alzhiemers ....This facility used to be wonderful, but haas slowly declined over the last 5 years. The food is good and could be great if the manager would let the chef prepare the food, it seems he is always worried about his budget. The staff is great and very sweet, but unable at times to help due to the facility being unlicensed. I wish things could be changed to the way I know they can be. I moved in here at The Waterford last two months. I have a kitchen, living room, bedroom, and bathroom, but I don’t like the food. They come in once a week, change my bedding, and clean the bed. I am now at The Waterford, and I like the outside of the building as there are a lot of areas to walk. It is very clean, open, and well lit. The dining area is average. The staff is really good. They have a library, church services on Sunday, Bible study, and exercise class. The food is average, nothing special, and only serve lunch. The Waterford had a smoke smell from cigarettes in one wing because it used to be a smoking community. They're trying, but they haven't gotten the smoke out yet, and it's something that bothers me because I'm a non-smoker. It's an H-style building and only one part of it had the smoke smell. The Waterford was excellent. Everything was impeccable and top notch. We ate lunch, and the food was delicious. The staff was so friendly and would do anything for you. The value was perfect for me because anybody could afford this place. The amenities were everything you would possibly want. They had a lady at the front desk who watched whoever came in and out and would check your ID, so you had to stop and check in. The lady that took us on a tour treated us like family. She was kind. I would recommend Waterford based on my one visit comparing it to my mothers present facility. I did have the opportunity to visit with a resident that moved from moms present community. And he loved it and was happy he moved. His bonus was that it was close to the golf course. We did not choose the Waterford because of the location so far from family. I sincerely felt that they were warm caring people. The building was nicely decorated and very clean. I like The Waterford at Fairfield because it is a nice place. The staff are nice. But mom does not want an apartment on the second floor and she wanted a more affordable facility. The rooms were fabulous. I would recommend this facility because it is a very nice place to stay. Their dining area looked nice. The Waterford was very large, nice facility with a high ceiling entryway. The people were nice, the activities were well-planned, and the dining area was quite nice. They only do independent living; they do some additional services but not complete assisted living. Even though it would have been much more convenient for me, Mom didn't want to consider going across town to Fairfield. The people were very nice and wonderful to talk to. We had a nice visit, a nice tour, and the people were great. Since they only did independent living at the Waterford, I have to probably rate it three stars. It's a wonderful place, otherwise, but not for us because of the possibility that it's just a matter of time before she'll need further assistance; I think she would have to move from there if she needed assisted living. We visited The Waterford at Fairfield. They were cordial and very nice. They offered us a tour and a meal. The dining area was very nice. They have puzzles and bingo. They have a lot of different things to do. However, I would have to have assistance for a shower and getting dressed, but it is $5 for every 15 minutes that they share with you, and that could get expensive. Nevertheless, we did recommend The Waterford at Fairfield to a friend, and he is living there now. My visit at Waterford of Fairfield was fine. The staff was friendly. From what I saw, it looks like a nice facility. The room that I saw was a studio room, and it has a kitchenette, a living room, a bedroom, and a walk-in bath. I was impressed with the facility. They also seemed to have good activities. They have a craft room, and I also saw an area where they were planting. From what I have seen, I would recommend this place. The staff was very much accommodating at Waterford. We had breakfast there, and we even had a deposit on an apartment. It is not an assisted living facility, but it does have a lot of amenities that are assisted, like, they do your laundry, they provide three meals a day, and transportation anywhere you want to go. There's always somebody there 24/7 and a full-time nurse, 8 to 10 hours a day. My husband is the one that really needs the assistance. So there's always somebody there if he would fall or someone to help him up. We like the rooms. It's kind of what we wanted. It's also right in the neighborhood where three of my children live. I like the walking area around the facility. Describe the overall population of independent living residents at The Waterford at Fairfield. What is their average age? What are their favorite things to do? Our residents enjoy a variety of activities ranging from games, bingo, art, baking, religious services, to going on outings and parties. We are located in the Village Green in Fairfield. We have the library, Community Arts Center, Kroger, and various stores and restaurants within walking distance. What are some recent off-site events that the community activity director at The Waterford at Fairfield has organized? They go out to eat, picnic in the local parks, sightseeing, and to museums and other points of interest. What transportation services does The Waterford at Fairfield offer to independent living residents? Transportation to doctor's appointments, shopping, and banking. What makes the chef or dining program at The Waterford at Fairfield exceptional? What kind of menu can independent living residents expect? Our residents enjoy a restaurant style dinning experience and are served lunch and dinner here at The Waterford. We have a large dinning room, a private dinning room, extensive lobby, library, great room, game room, outside patio, and an arts and crafts room. What safety features or security measures does The Waterford at Fairfield offer to independent living residents? We are staffed 24/7 and have a call system in place for help when needed. If The Waterford at Fairfield accepts dogs or cats, what indoor/outdoor areas can they enjoy? There is green areas and sidewalks surrounding The Waterford. Does The Waterford at Fairfield work with an agency or registry to provide nursing and medical assistance as needed? We have on-site skilled home healthcare services as well as private duty packages and an ale carte selection of services based on an individuals needs. There is a home care nurse in the community 5 days per week and home care aids here 7 days per week. Seize the opportunity to thrive at The Waterford at Fairfield, where residents have the freedom to focus on family and friends thanks to our modern amenities and convenient services. 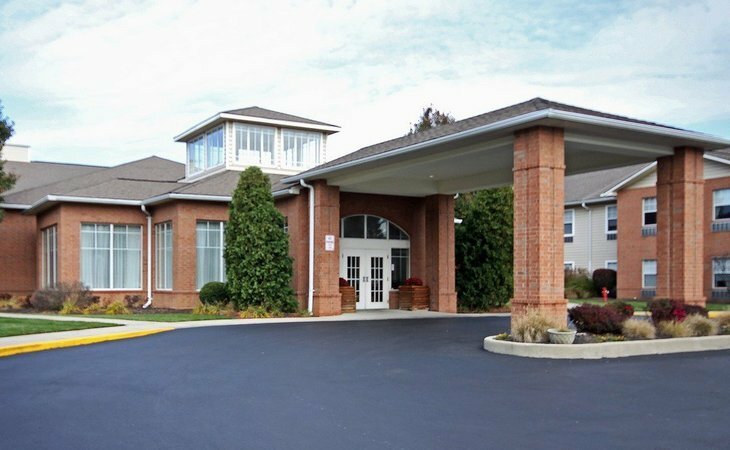 Our Independent Living community in Fairfield, Ohio, offers the privacy and freedom to live the way residents choose in comfortable studio, one- and two-bedroom apartments boasting walk-in closets, well-appointed kitchens and a great number of safety features. At the same time, we offer companionship. Say goodbye to home maintenance, housework and the worries of living alone with our personal laundry and housekeeping services and 24-hour staffing. Say hello to a relaxed lifestyle complete with regular home-cooked meals, medication management and daily newspaper delivery. Our caring and professional staff is ready and willing to transport residents to and from medical appointments, shopping excursions and special events. From our thoughtfully designed floor plans to the world-class service and myriad recreational and social opportunities we offer, residents may just find that we have thought of everything. What should caregivers and potential residents know about The Waterford at Fairfield?